﻿1. When LinkoCare cornea will be available? Company’s cornea will be available commercially in 2016. 2. Where LinkoCare cornea will be offered to patients? Our aim is to offer LinkCor™ corneas globally and wherever the need is! Availability will however depends upon each country's medical device registration requirements. 3. What are patients’ options other than bioengineered corneas? The available options are Human donor cornea from cadaver and prosthetic artificial corneas. 4. What are the advantages of bioengineered corneas over other options? 5. What is the risk of disease transmission? The risk of disease transmission through bioengineered cornea is zero while the human corneas must undergo expensive and time consuming testing to ensure there are no diseases that can be transmitted from donor to host. However there is still risk involved with the human donor cornea. 6. How long does it take to perform the procedure for corneal transplant? It depends on the type of procedure and complexity of the condition that is treated. However, a corneal transplant is usually done in less than 1 hour. 7. What types of patience are suitable for LinkoCare cornea? LinkCor™ cornea can be primary used for indications such as corneal scarring and keratoconus. It can be used both for patients with severe corneal blindness who may need a full-thickness implant and for those who suffer from corneal vision impairment who may need a partial-thickness implant. 8. What is the cost of LinkoCare cornea as well the cost of its implantation procedure? 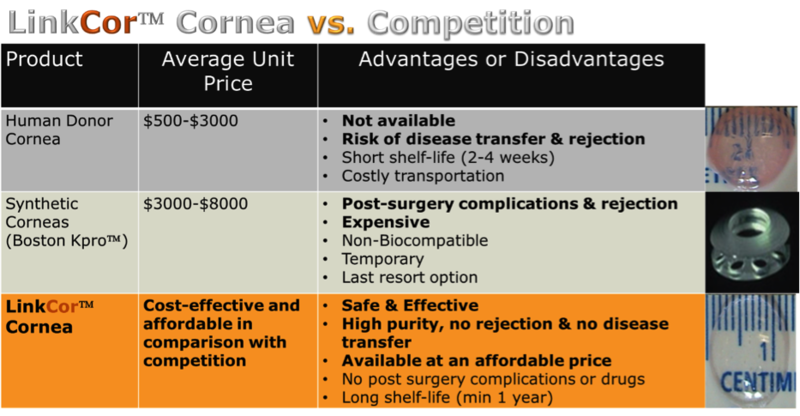 The LinkoCare cornea is more affordable than donor and synthetic corneas. The cost of corneal transplantations varies depending on the country, type of procedure, instrumentation used in the procedure. 9. Are there any age limitations for the use of the LinkoCare cornea? LinkCor™ has been successfully tested in a small population of patients. It is therefore unknown whether the cornea will be suitable for all age patients. More information will be available soon once the ongoing and the near future clinical trials are completed.